The man's tie was stained, his face was smeared with red lipstick, and a half empty bottle of gin was sticking out of his torn coat pocket. He opened his newspaper and began to read. 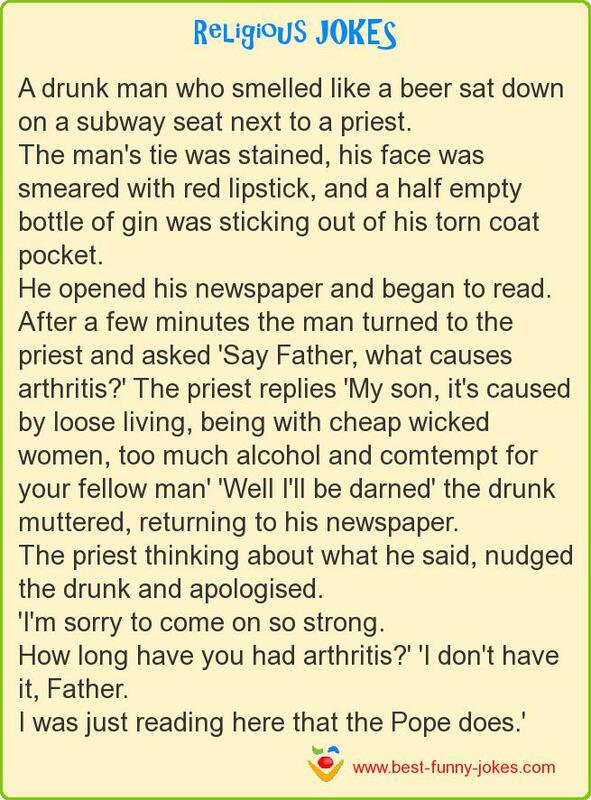 After a few minutes the man turned to the priest and asked 'Say Father, what causes arthritis?' The priest replies 'My son, it's caused by loose living, being with cheap wicked women, too much alcohol and comtempt for your fellow man' 'Well I'll be darned' the drunk muttered, returning to his newspaper. The priest thinking about what he said, nudged the drunk and apologised. 'I'm sorry to come on so strong. How long have you had arthritis?' 'I don't have it, Father.